Yosemite National Park is one of the most stunning parks in the country. It is renowned for sights like the magnificent Yosemite Falls, and the steep granite cliffs of Half Dome. Yosemite Valley is the heart of the park, and one of the premiere hiking spots America’s west. There are routes for every season, spanning from short and sweet treks to challenging multi day hikes. Along the way a diverse array of animal species can be found. Over 80 mammals live there including black bear, mule deer, mountain lion and marmot. As well as more than 200 bird species like the endangered peregrine falcon, giant gray owls and bald eagles that inhabit the area. The valley itself is approximately one-mile wide and seven-miles long. Enveloped by glacier-carved granite walls and dotted with waterfalls, the valley is what most people envision when they hear about Yosemite. It’s here you’ll find the most iconic sights like Yosemite Falls, which cascades down from 2,425 feet above. And the famous view of Half Dome. For park visitors, highlights of Yosemite Valley include: Yosemite Village, Yosemite Museum, the Ansel Adams Gallery, eateries, a grocery store and gift shops. You can also spend the night in Yosemite Valley’s campgrounds and motel rooms. The question as to when to visit really depends on what you’re looking for in your hiking experience. The park is open 365 days of year, but spring may be the best time of all with everything coming to life. During spring, dogwoods will be in bloom, the animal babies make their debut and the waterfalls will be flowing at their peak. The big crowds of summer have yet to arrive, which means no worries about bumping elbows out on the trail. And you might even be able to glimpse lunar rainbows that appear in the mist around the base of Lower Yosemite Falls on a clear, full moon night. Summer is peak tourist season, bringing the majority of the four million visitors that arrive each year, with the Valley rather chaotic and long lines even out on the trails. By mid-summer, afternoon temperatures are sizzling and many of the waterfalls dry. During autumn, visitors start to diminish and vibrant foliage transforms the landscape starting around mid-October. Winter is a quiet time in the park. While many trails will be icy or covered with snow, they can be ideal for snowshoeing through magical wonderland with frozen falls and snowy peaks. What to pack and wear out on the trail depends on the season, with spring and fall often bringing a mixed bag that requires both warm and cool weather attire. Dress in layers that can easily be removed or put on while hiking. Early mornings and nights can be quite chilly, requiring a warm, waterproof coat. In the summer, it’s likely to be quite warm throughout the day but you’ll still need a sweatshirt or light jacket for evenings. Winter means bundling up in cold weather gear, including warm, waterproof boots, warm coat, gloves and hat. Tunnel View Outlook, El Capitan (one of the largest granite monoliths on the planet) Vernal Fall, Bridalveil Fall, Nevada Fall, Yosemite Falls and Half Dome trails can all be hiked from Yosemite Valley. The east end of Yosemite Valley is where you’ll find the majority of trailheads. Hiking trails in and around the valley can easily reached by taking the free Yosemite Valley Shuttle. The shuttle makes 19 stops past park stores, trails and all the overnight accommodations and major viewpoints. It loops by every 20-30 minutes and operates from 7 a.m. to 10 p.m. throughout the year. The shuttle is a hop-on hop-off bus so you don’t need to worry about grabbing tickets or scheduling routes beforehand. During the busy summer season, it’s much easier to get around on the free shuttle than it is to drive. Vehicles are discouraged in this part of the park to prevent pollution and traffic. Aside from taking in the views, hiking is one of the best ways to experience Yosemite. There are over 50 marked hiking trails throughout the park for day hiking. Unlike the campgrounds, there are only 4 trails that close during the winter season: The Mist Tail, John Muir Trail, Half Dome Cables and the Four Mile Trail. The rest of the trails are open for adventure year-round. This short hike near the end of the valley is just a half-mile round trip with little elevation gain, making it easily doable for most. While crowds are steady, they aren’t overwhelming and you’ll be able to explore a pair of islands in the Merced River, which serves as an ideal place to cool off from summer’s searing sun. During late summer and autumn when the water levels are lower it makes for an especially tranquil walk through the forest, crossing a bridge over the river where it gently tumbles over and around the boulders. In the middle of spring, snow melt usually causes it to swell with raging whitewater rapids while the dogwood trees look especially picturesque with their blossoms. The dirt trail will lead you to a nature center, open April through October, showcasing interactive displays about natural history and wildlife in the area. One of the most popular hikes in Yosemite Valley is this 1 mile round trip trek that leads to one of the prettiest waterfalls in the park—Bridalveil Falls. From the trailhead, you’ll be able to see the cascade through a pine forest, plunging 620 feet from a hanging valley. Follow the paved trail from the parking area to the base of the waterfall. While the water is especially powerful in the spring, it flows all year-round. Be extra cautious traversing slippery rocks while approaching. In the springtime the mist is so heavy and carries so far, you’ll need to wipe off your sunglasses, sometimes from as far as a quarter-mile away. If you’d rather not get wet, wear a waterproof poncho or jacket with a hood on this hike. Yosemite Falls is the tallest waterfall on the continent – 10 times higher than even Niagara. This waterfall is so high that it includes a couple of drops along the 2,425-foot-cascade, the fifth tallest in the world. Providing a big reward for an easy half-mile round trip jaunt, the water will be flowing at its peak in spring and into early summer, a time when you can expect to get at least a little wet. If you wait until later in the summer or early fall, you might miss it as it’s often dry. Otherwise, expect to enjoy dramatic views that come both at the start and at the end of the 320-foot-high lower fall. Provided the path isn’t covered in ice or snow, its both wheelchair and stroller accessible, making it popular with hikers of all ages and every fitness level. This route will get you as close to the base of Half Dome as you can get. It’s one of the best ways to capture a photo of its crown reflected in the still waters of what’s referred to as Mirror Lake, which is not actually a lake but a large pool in Tenaya Creek. Bring your bathing suit and you can take advantage of one of the park’s most popular swimming holes too. The first mile is all paved, leading straight to Mirror Lake, with a loop trail following Tenaya Creek beyond. The best time to hike it, especially if you want to take a chilly but refreshing dip, is in the spring and early summer when the creek will be flowing freely with snow melt. Exhibits along the way highlight some of the area’s cultural history as well as the lake-to-meadow succession. If you want to enjoy a pleasant hike over both boardwalks and paved paths that doesn’t take a lot of effort, this route is ideal. Sentinel and Cook’s Meadow loops combined stretch about 2.25 miles. The loops lead around and through a pair of meadows, Cook’s Meadow north of the Merced River, and Sentinel Meadow south of it, while offering stunning views of Half Dome and Yosemite Falls. The best hiking is typically from late April through mid-June when the falls are really going and the wildflowers are in bloom. It brings the opportunity to experience numerous viewpoints of the falls for capturing postcard-perfect pics. In fact, when you’re flipping through the gift shop postcards, you’ll probably see many of them showcased in print. As you stroll through the lush meadows, watch for baby blue eyes, pine violets, western azalea, evening primrose, goldenrod, shooting stars and other flower varieties dotted across the landscape. You may know Turtleback Dome from its webcams, but the views are a lot more impressive in real life. It’s an ideal short, easy trek that brings classic Yosemite vistas, without the tour buses to get in the way. While the hike is just 0.6 miles one way following a service road, it does climb steadily so you might have to stop occasionally to catch your breath. But the views are sure to be worth the effort. To the north you’ll see the top of the 600-foot-high waterfall known as The Cascades along with various towers of the dome. To the west, the High Sierra fades into the foothills. One of the highlights of this trek is the chance to see a rare Sierra wildflower, the Yosemite Lewisia, also known as the Yosemite Bitter Root, growing only in a narrow band of the southern Sierra Nevada. This lightly used out-and-back trail offers Tunnel View-like vistas without the massive crowds that are usually found around Tunnel View. A relatively easy two-mile round trip hike with 500 feet of elevation gain – the first half is steep, and you’ll have to negotiate around some fallen trees during the latter half, but it’s remarkably little effort for the reward. The trail showcases part of Half Dome and much more of Clouds Rest as well as points you can’t glimpse from Tunnel View. Parts of Ribbon Fall and North Dome as well as the Merced River, Royal Arches and Bridalveil Meadow, make it an ideal day hike for photographers, and as the name belies, artists. For the best pictures, plan to hike in the hour before sunset. The Vernal Fall footbridge is located about a mile in from its trail head, which often serves as a stopping point for those hiking to Half Dome or the top of the Mist Trail. This is where the first view of Vernal Fall can be enjoyed, as well as the Merced River on either side. While it’s short, it’s likely to provide a good workout with 300 feet of elevation gain, made easier by bringing along a hiking stick. If you can manage to walk a bit further, you’ll get an even better view of the waterfall, or further still in the spring or early summer, continue until you can feel the spray before turning around. Hike to the flat granite shelf known as Inspiration Point and you’ll get the same views as you would from Tunnel View without countless others obstructing it. While it’s a short hike, it’s up hill the entire first half. But that just means it discourages other hikers, providing rare opportunities for more secluded looks and fantastic photos. Just after a storm, when the sky is clearing and fog is drifting through the valley the clouds cast patterns of light. At sunrise, the light is usually the best. If you’re feeling inspired, you can continue uphill to Old Inspiration Point, where in 1851 an Army party pursuing Indians first caught sight of Yosemite Valley. This short hike with lots of steep switchbacks is considered moderate, requiring a decent level of fitness to reach the viewpoint known as Columbia Rock. Located along the Upper Yosemite Falls trail, about a third of the way in it showcases 180-degree views from the Cathedral Spires to the west and Half Dome in the east. A sign at the bottom of the trail explains more about the route that was laid out in the 1870s, including the stone steps shaded by the forest. While you won’t see Upper Yosemite Falls on this trek, keep an eye out for the graceful waterfall that spills down the cliffs and drains into a small basin on the east side of Eagle Peak. During late spring and early summer, some colorful wildflowers are likely to come into view as well. This is the trail that will bring you to up-close views of Vernal Fall as well as unique views across Yosemite Valley. The first mile is paved and busy, nearly entirely uphill, and leads to the Vernal Fall Footbridge. Continue on the Mist Trail another half-mile following the steep granite stairway that requires a bit of lung power, watching your footing cautiously due to the heavy spray of the waterfall, especially in spring and early summer. Along the way will be jaw-dropping views of Vernal Fall, and if the sun is out, you’re likely to see a rainbow develop in the mist. When you reach the top, you’ll be able to peer down the entire length of the rushing 317-foot waterfall before making your descent back. Yosemite Valley offers plenty of challenging day hikes as well, like the 4-Mile Trail that while strenuous, provides the more adventurous hiker with views of Yosemite Valley and Yosemite Falls along with a stunning backdrop of the Sierra mountain peaks and Half Dome. The trail climbs from the valley floor near the Swinging Bridge to the south valley rim at Glacier Point. Here, hikers can grab an ice cream as a reward for all that hard work. Many adventurers arrange for a ride from the parking lot back to Yosemite Valley from here, but you can make the return by reversing the route, just keep in mind that hiking it round trip takes six to eight hours. A great trek for the serious Yosemite hiker is the Pohono trail. This east-west route travels the south rim of Yosemite Valley from Glacier Point to Tunnel View. It showcases nearly everything the Valley is famous for, though it can only be accessed when Glacier Point Road is open; usually from around mid-May through early November. As with many hikes in Yosemite, the earlier you go in the season the better, with waterfalls flowing at their peak. 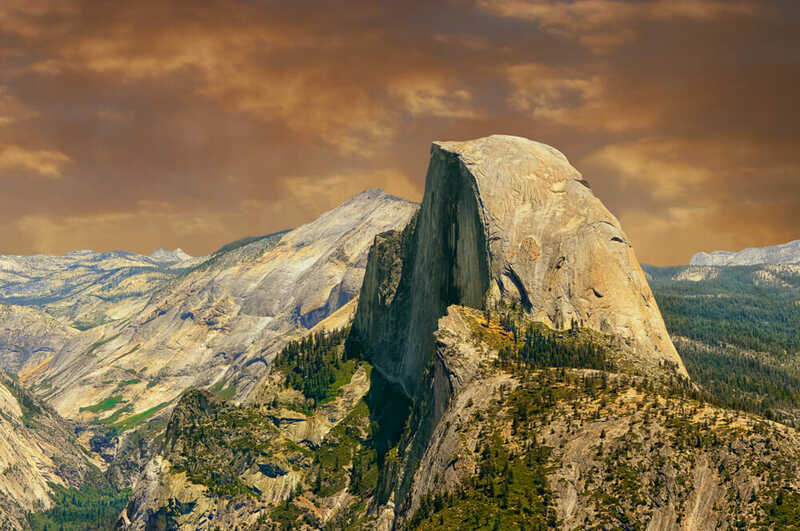 You’ll be able to take in all the iconic natural landmarks, passing Glacier, Taft, Crocker and Inspiration Points, Sentinel Dome and Tunnel View as well as Vernal, Yosemite, Bridalveil and Nevada falls, El Capitan, Half Dome and more, with occasional glimpses of the valley in between. It’s going to be a difficult climb for at least a mile starting out, although it does get easier as it progresses. While the super-fit, meaning athletes-in-training, can do this trail round trip in a day, most make this a one-way adventure requiring transportation at the end of the hike. You’ll pass Mirror Lake early on before getting a distant view of lesser-known Hidden Falls while ascending the trail. The route generally sees little traffic, especially compared to other trails in the valley, while also providing good views of granite land forms like Half Dome and Clouds Rest. The views become increasingly more impressive the higher you climb. This steep hike has been called the ultimate StairMaster workout – the equivalent of climbing the Empire State Building twice, but the views you get won’t be what you’d find in a fitness center or in Manhattan. One of the oldest trails in Yosemite, built in the 1870s, it leads to the top of Yosemite Falls, North America’s tallest waterfall. The arduous trek is well-worth the magnificent views at the top, which includes Yosemite Valley, Half Dome, Sentinel Dome and many of its iconic natural land forms. While the trail is open year-round it’s the most awe-inspiring in the spring when the falls are so powerful, you’re likely to get wet from the spray while getting unique perspective of the surrounding granite. From the top, you’ll even have the opportunity to photograph both Half Dome and Yosemite Falls in the same frame. The most popular hike in the park, the granite crest soars 4,737 feet above the valley floor with its summit once believed to be inaccessible, at least until iron eye bolts were drilled into the rock. Eventually, cables were installed on the final 400 feet, allowing trekkers to pull themselves up the astoundingly steep grade of smooth granite to get to the top. The hike is so popular that the park restricts permits to just 300 per day: 75 for backpackers and 225 for day hikers. For the best chance to snag a permit, you’ll want to plan ahead and enter the permit lottery. Applications are accepted by the national park service during the month of March, no matter when you plan to hike, whether it’s June or September, with winners notified in April. To increase your odds of success, choose a weekday. September and October will also give you the highest chances of getting a permit to hike Half Dome. If you miss the application deadline, there are additional permits handed out each morning to 50 lucky hikers. Don’t bank on snagging a same-day permit though. In 2017 there was a success rate of just 19% each morning. The permit system was implemented for safety reasons in 2010. Before that, overcrowding on the cables made it rather dangerous, with as many as 1,200 people attempting the hike and two dying while climbing the cables the previous year. Getting to the top is worth the nerves. You’ll end up with a spectacular view of the valley; and one that only few people ever experience. If you plan to hike partway, spend the night and continue up the half dome cables you’ll need a backpackers wilderness permit. 75 of these are issued per day. The permit to will be valid for the entire length of your wilderness reservation. Day hiking with a backpacking permit up half dome is not allowed. While thousands of people manage to safely summit the peak every year, it is not for those with a fear of heights or those who are out of shape. It can take 11 hours or even more, with nearly 5,000 feet of elevation gain over the course of the hike. You’ll need to go after Memorial Day, which is when the park rangers place the steel cables covering those last 400 feet – they typically come down the day after Columbus Day in October. Be prepared by bringing appropriate clothing and gear, wearing sturdy hiking boots with plenty of grip, as most ordinary running or tennis shoes will slip. Gloves are important for gripping the cables and preventing blisters. Clothing should be worn in layers as it will be cool in the early morning hours but as the hike progresses and the sun begins to peak, it’s likely to be quite warm or even hot, especially during the middle of summer. If you’re hiking half dome via the mist trail as most people do, you will get wet! Bring a waterproof jacket for the portion as you pass by Vernal Fall. A hat, sunglasses and sunscreen are all necessary for protection too. It is recommended that you bring about a half liter of water for every hour of hiking. The trip up half dome and back can typically last 10-12 hours for a reasonably fit person. That means you should pack at least 5-6 liters of water. A robust day pack will be the best choice for carrying a lot of water and storing extra layers of clothing. You’ll want to pack a few snacks as well to keep the fuel up. Protein, granola bars, sandwiches, trail mix and beef jerky are all good choices. There are two main routes to get to the Half Dome hike: via the Mist trail and by way of the John Muir Trail. The John Muir Trail will be less crowded and less steep; but it will also add an additional 1.5 miles to your trek. These two trails converge at Nevada Fall. Start this hike early in the morning, around sunrise. You’ll be able to take in a glorious view of the sun as it peaks over the granite bluffs. The shuttle system starts at 7am so you’ll either want to spend the night nearby or drive your own vehicle into the valley to avoid the crowds. The hike to half dome begins on the popular Mist Trail and heads towards Vernal and Nevada Falls. Climbing steps to the top of the Mist Trail, Yosemite National ParkThe Mist trail starts out smooth and flat but quickly graduates to a wet and slippery staircase. As you climb up along Vernal Fall, you will get a wet! Mist from the waterfall will spray over you and soak your clothes and backpack. The Vernal Fall overlook is a fantastic view to take a break and snap some photos. The footbridge at the top is a turnaround point for many day hikers doing short trips around Yosemite Valley. This is the last point to use flush toilets and fill up your bottles with potable water. Once you pass the footbridge, the crowds will disperse significantly and you’ll be left with those headed up half dome, and backpackers on their way to little Yosemite Valley. Continue past Vernal Fall up the switchbacks to Nevada Fall, stopping to catch your breath and take in the view. Just 0.2 miles off this trail to the right you can grab a spectacular view of Nevada Fall itself. It makes a great detour weather on the way up or on the way down. Next comes Little Yosemite Valley, a flat 1.5 mile section leading up to the subdome. The forested path will be a welcome break for your legs and is a popular resting place for backpackers making a multi-day climb to the summit. You’ll find composting toilets and two fire rings located there. Don’t forget to pick up a wilderness permit if you plan to camp! After passing Little Yosemite Valley, the path the to subdome is a forested 1.5 mile climb up switchbacks. Take advantage of the shade, because the trees will eventually disappear behind you exposing an uphill scramble. Rangers will be around the base of subdome to check permits before continuing your hike. Over the last mile you’re faced with rocky stairs and high elevation. Peaking the subdome, the cables will inch closer and closer as you climb, displaying a good view of what’s to come. Give yourself a rest as you arrive at the base of the cables. You’ll want to get hydrated and put on a pair of gloves. The climb up Half Dome gets steeper as you move along. So while you may not need your hands at first, arm strength will become an asset near the top. The granite path up Half Dome slopes as much as 70% in some areas. This is a long, 400 foot climb and can take 20-45 minutes depending on your fitness level. Along the way, wooden slabs have been drilled into the rock face about every ten feet. The cables are wide enough that you can, and probably will pass slower hikers on the way up; especially on a crowded summer day. Take the hike slow and watch your footing. The rocks can get slippery and the path has been worn down overtime from previous hikers. Once at the summit, you’ll be greeted with a bird’s-eye panoramic vista of the High Sierra and Yosemite Valley below. The height and scenery is indescribable. Grab a snack, drink some water, and bask in the sunlight. The way down Half Dome can sometimes be more dangerous than the way up. You’ll be fatigued and if you left early in the morning, the cables will be crowded with more hikers later in the afternoon. Take your time before starting the decent. Regain some energy at the summit and move slow on the way down. The hike back is just as gorgeous as the way up. You’ll get a different perspective of the valley and can take a quick detour to Nevada Fall if you didn’t on the way up. If you have the energy, we recommend hiking up the Mist Trail, and going down the John Muir Trail. That will give you a different angle of the area as well as a great view of Nevada Fall. Make sure to plan on a few days of rest and recovery afterward. Unless you’re hiker who does this on a regular basis, you’re going to be sore. You’ll also have quite the story to tell friends having conquered one of the world’s most beautiful and famous overlooks. A great way to finish out the trip of a lifetime is to head back to the valley, check out the gift shops and galleries, and spend the night. Yosemite has numerous campgrounds in and around the park. We recommend spending a few days exploring the area and taking short trips to lesser known portions of the park like Hetch Hetchy and Tuolumne Meadows.